University in Bulgaria in 2011. Currently she works as Head of Marketing at a leading information and communication technologies company in Bulgaria. 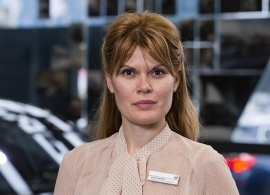 Her previous professional experience includes working as Head of Sales and Marketing at Auto Bavaria Ltd and Marketing Manager at Toyota Bulgaria. Ailita holds a BA in International Finance and Trade from the University of Portsmouth. Following a thorough research and analysis of different opportunities, I chose AUBG's Executive MBA Program because the course schedule does not interfere with one‘s daily duties and work. I wanted to become part of a new community, a community that values ingenuity, avant-garde ideas, advanced thinking, and also—and this is very important— the thirst for innovation. What was the most valuable lesson you learned while studying at the EMBA program? What was most valuable to me was meeting talented and inspiring managers, leaders and entrepreneurs. We helped each other grow and learn and at the same time we were learning from the best! By sharing ideas and building upon previous experience, we polished our knowledge, skills, analytical methods and level of responsibility. What is your overall impression of the program? The aim of the EMBA Program is to support managers on their way to further develop their careers. The program uses modern management practices and offers students the opportunity to work on real-life case studies. This allows participants to acquire a wider perspective on business and the tools to develop a strategy for their further professional development. The various program modules give you the unique opportunity to become part of an elite society of leadership and innovation where you improve your leadership skills while at the same time creating friendships for life. The teamwork required in classes is extremely satisfying but also challenging. You get to communicate with smart and interesting people with different points of view and you have to navigate through the diversity of personalities and ideas in order to reach a common solution and achieve the best end result possible. I met incredible people: both students and professors. Today we are good friends, we have fun, we celebrate our birthdays together, and we give each other advice on the challenges we face in our daily lives. Do you think that an EMBA diploma could affect one’s career? I would only say one thing: If you want to learn the difference between proactively looking for sustainable business solutions and simply “fighting fires”, then sign up for the EMBA program at AUBG. It will help you enrich your knowledge and improve.